Pink Daisy Pearl Chandelier Shade - Dazzling Daisies! This scalloped edge pink dupioni chandelier shade is sprinkled with pink pearl daisies and bright pink embroidery. We recommend a 25-40 watt bulb for all chandelier shades. Full Description Pink Daisy Pearl Chandelier Shade - Dazzling Daisies! 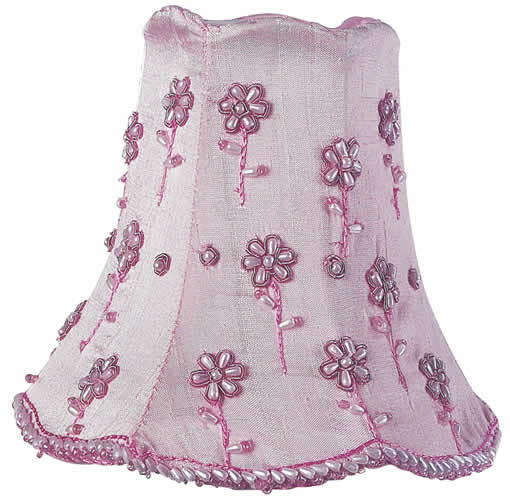 This scalloped edge pink dupioni chandelier shade is sprinkled with pink pearl daisies and bright pink embroidery. We recommend a 25-40 watt bulb for all chandelier shades.